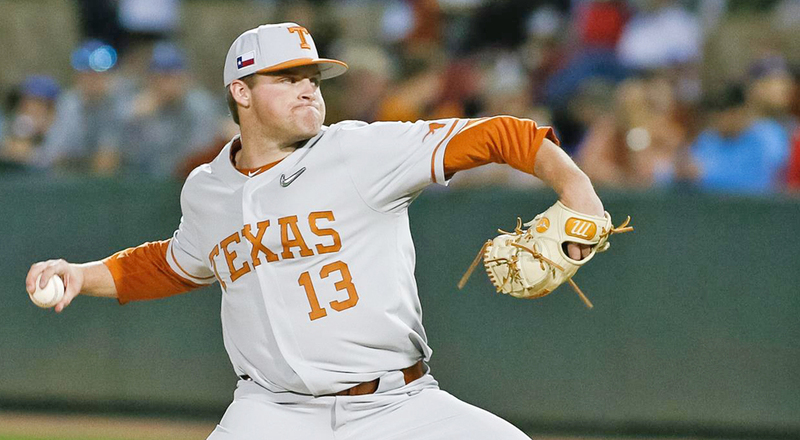 Starting pitcher Bryce Elder gave up eight hits and five earned runs as the University of Texas basebal team fell, 6-4, Friday to Kansas State (photo courtesy of texassports.com). AUSTIN, Texas — The University of Texas baseball team's toughest games — that stretch of 16 contests against ranked teams over five weeks that forged the Longhorns’ resolve and competitiveness in the face of a little bit of everything: rain, cold, an inconsistent defense and no real go-to run producer among a roster full of good, but not great, hitters — were supposed to be behind it. But someone forgot to tell Kansas State that it was supposed to be a pushover, despite the fact that it came to Austin for a three-game series with just 14 wins and one victory in five Big 12 Conference games. Texas played from behind throughout against the Wildcats in the series opener Friday, as ace starter Bryce Elder struggled first with giving up hits, then with throwing strikes, and then with just getting outs in a 6-4 Longhorns’ loss. Kansas State (15-20 overall, 2-5 in Big 12 games) was aggressive from the start and never took its collective foot off the accelerator. The Wildcats scored twice in the first inning on a groundout by shortstop Thomas Hughes and a ringing double to left-center field by right fielder Zack Kokoska. Texas cut the lead to 2-1 in the third on a two-out RBI single by shortstop Masen Hibbeler that plated center fielder Duke Ellis. Kansas State charged back with a two-run home run from catcher Chris Ceballos in the top of the sixth inning. The Longhorns answered with two runs in the bottom of the frame via a double by right fielder Austin Todd that plated Hibbeler and a single by left fielder Tate Shaw an out later to push home Todd. But the Wildcats responded again, scoring runs in the seventh and eighth innings on RBI hits from Hughes and second baseman Caleb Littlejim, respectively. The seventh-inning uprising chased Elder (2-2) who left after surrendering eight of Kansas State’s 10 hits and five of the Wildcats’ six runs while walking two and striking out three. Texas trimmed the lead to 6-4 in the eighth on first baseman Zack Zubia’s double that drove in Todd, but Kansas State lefty reliever Will Brennan (who started the game as the Wildcats’ center fielder) snuffed out the Longhorns rally by retiring all five batters he faced for his first save of the year. If there’s a player that’s due to get on an extended hitting streak and have a couple of grounders find a hole, it’s Zubia. He has constantly made great contact this season but most times those balls that are put in play end up being caught. If this game was supposed to be easy, the Longhorns (22-24 overall, 4-5 in Big 12 games) are in a world of hurt. They also have to put the loss Friday in the rear-view mirror, in a hurry, and get refocused. A look at the Longhorns remaining league schedule shows two more contests against Kansas State, a road series at Oklahoma State April 18-20, at home against West Virginia April 26-28, at Kansas May 3-5 and a big final set at home against Oklahoma May 16-18. Then there are Tuesday games April 16 against Lamar, with Texas State on the road April 23 and at home May 7, at Texas A&M-Corpus Christi April 30, and at home May 14 against Incarnate Word.